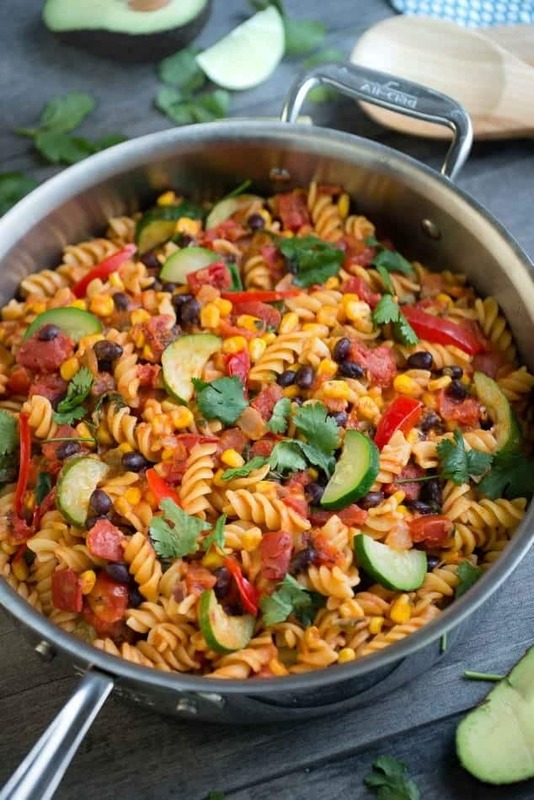 A delicious and easy One Pan Taco Pasta Skillet with Vegetables has your favorite taco flavors cooked in the same pot. Perfect for hiding any extra veggies and easy enough for weeknights! With Cinco de Mayo just around the corner, I’m sharing another Mexican inspired dish that you can make easily in just one pan. Along with slow cooker meals, one-pot/one-skillet meals are my my lifesaver. 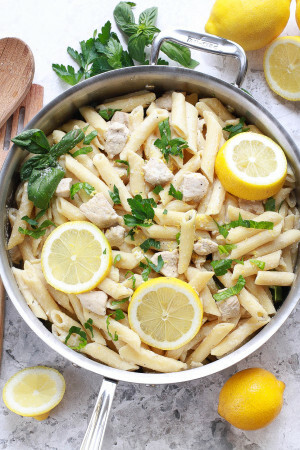 They are fast, easy and the perfect solution to weeknight dinner craziness. Plus they are great for hiding veggies and clean up is a breeze which totally works for me since dish washing is one of my least favorite chores. 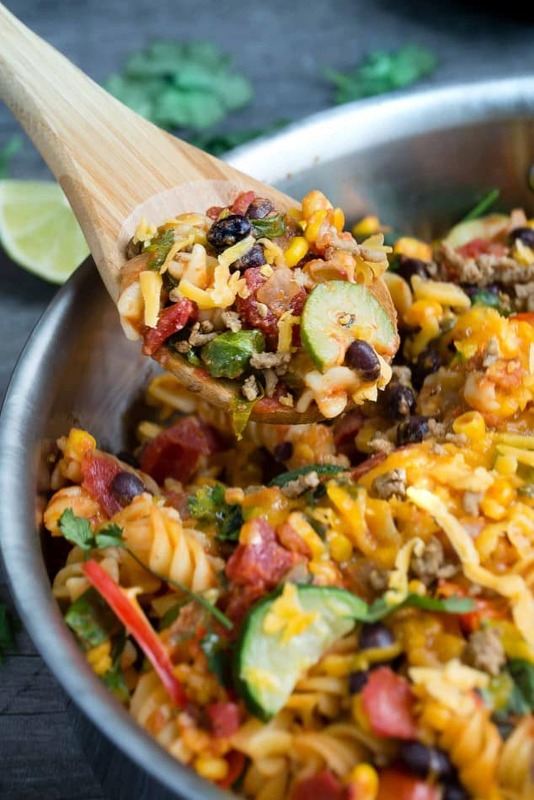 This easy One Pan Taco Pasta Skillet comes together effortlessly in under 30 minutes and has become one my husband’s favorite dishes. 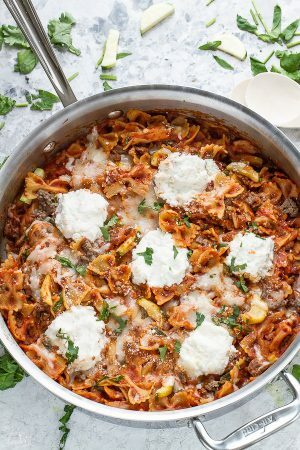 He is a big fan of anything Mexican — especially tacos and enchiladas and he totally dug this pasta version. It’s also the best for sneaking in extra veggies. I loaded this one up with some spinach, corn, a medium zucchini and a bell pepper. I used lean ground turkey and some black beans but you can totally use beef or chicken if you prefer. 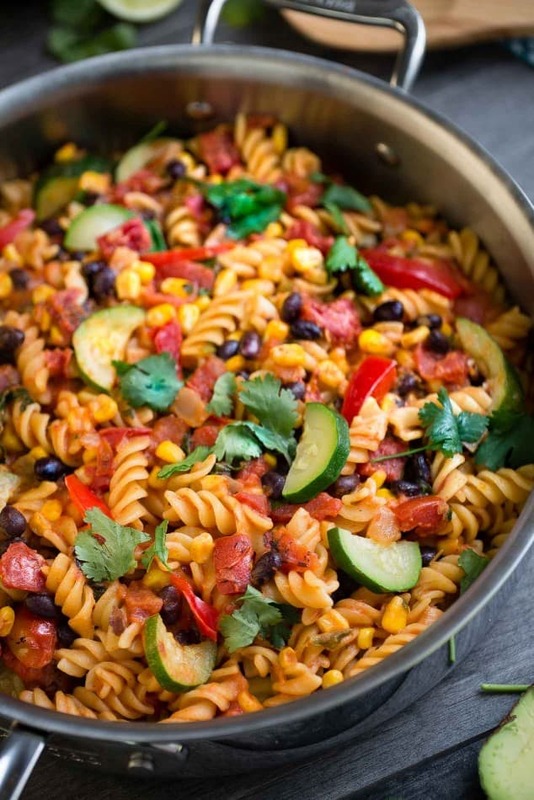 A delicious and easy pasta dish with all the flavors of a taco made all in one pan. Perfect for weeknights and hiding in extra veggies. In a large skillet over medium heat, saute onions and garlic in olive oil over medium heat, for 1 or 2 minutes until fragrant. Add bell pepper and cook for another minute. Add ground meat to skillet and cook until brown, about 4-5 minutes, breaking up the meat as it cooks, Season with salt and black pepper, to taste. Drain any excess fat. Add entire can of crushed tomatoes (undrained), tomato sauce, dried pasta, seasonings, corn, black beans, jalapeno and chicken broth. Bring to a simmer, cover with lid and reduce heat to low. Cook for 12 minutes, stirring gently every few minutes so the pasta doesn't stick. Stir in chopped spinach and zucchini then replace lid and allow to cook for an additional 2 minutes until pasta is tender. Season additionally with salt and pepper, as needed. Remove from heat and stir in one cup of cheese. Replace lid to let cheese melt. Once cheese has melted, sprinkle with more cheese, cilantro, diced avocados, cilantro, sour cream or any other toppings of your choice.